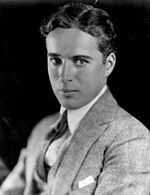 Chaplin's comic performance however was singled out for praise in many of the reviews. In April 1910 he was given the lead in a new sketch Jimmy the Fearless. Setting high standards he told himself "This next film must be an epic! The Greatest!" Inspired by a photograph of the 1898 Klondike Gold Rush and later the story of the Donner Party he made "an epic comedy out of grim subject matter. He soon developed the Tramp persona and formed a large fan base. His career spanned more than 75 years from a child in the Victorian era to close to his death at the age of 88 and encompassed both adulation and controversy. Chaplin became increasingly political and his next film The Great Dictator (1940) satirised Adolf Hitler.